It has to look crazy to the muggles — the non-knitters. 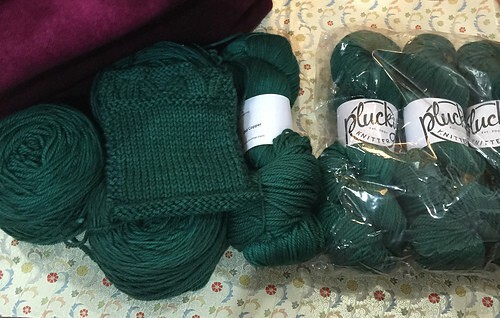 These KAL months: Malabrigo March, Adventurous April, and now, Plucktober. A month of intense knitting. I've got plans to go to bed early and get up in the still dark hours to get in some knitting before work. And I'll need to keep my yoga up to avoid back and neck problems. I'm nothing if not serious about this! Glacier is coming out of hibernation. This knit along permits you to enter a work in progress if the finished project will take more than 1,000 yards of yarn and you are less than 50% done. With only the back of my Glacier complete, I'm hoping the KAL will motivate me to knit the front and get started on the sleeves. I'm going to knit Michelle Wang's splendid, cabled, Arlo cardigan for my youngest. Sadly, that now means knitting a sweater in a size larger than the one I wear. In addition to writing beautiful, well thought out patterns, Michelle is incredibly kind and has promptly answered a few questions I've asked her. Even though they were sort of dumb as questions to go, she managed to make me feel great and give me just the information I needed. I'm using this fabulous dark green "Old Copper" merino on a superwash base called Trusty because I expect this one to get some heavy kid-wear. Plucktober starts on October 1, so I've prepared a few meals in advance and put the family on notice that I may go straight for my knitting when I get home from work at the end of this week. I haven't clued them in that it lasts for a month. I'm pretty sure they'll survive, and I'm looking forward to it!